Natasha Welsh has been jailed for life for stabbing Martin Welsh at their family home. A drunk woman who murdered her husband while their son played the PlayStation upstairs has been jailed for life. Natasha Welsh, 43, stabbed Martin Welsh, from North Ayrshire, with a 15cm kitchen knife on October 26 last year at the family home in Hendon, north-west London. 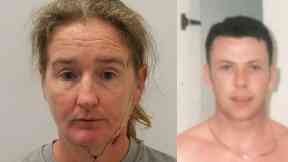 At the time of the killing, Welsh's relationship with the 47-year-old had turned "toxic", jurors were told. The couple were regular drinkers who would consume more alcohol on a Friday, which they called "fight night". The mother-of-two was said by her children to have the "strength of ten men" and behaved like a "lunatic" while under the influence of alcohol. Judge Alexia Durran told Welsh: "In recent years, your life has revolved around alcohol. You started drinking in the afternoon before your husband returned from work. "In a heightened state of intoxication and anger, you picked up a kitchen knife from the block on the work surface and stabbed Martin in the chest. "I accept you are wracked by guilt about killing Martin and the effect on your children." In a statement, the couple's daughter Charlie told how she and her younger brother "feel we have lost both parents, not one" as a result of the verdict. She said they missed their "big bubbly" father "immeasurably", but added: "We know in our heart of hearts our dad would not want our mum to suffer in this way. "He did genuinely love her no matter what happened and that is the main reason he would never leave her."